Titration solutions - Concentration determination with highest precision. Our titration solutions application chemists have prepared more than 700 ready-made titration applications for use with the wide range of METTLER TOLEDO titrators. These proven and well-tested titration applications will help you to get accurate results quickly. Our online search engine allows you to search through the titration application database. Titration Excellence line featuring One Click Titration™. A new milestone in titration solutions for simple, efficient and secure titration. Easy-to-use and compact endpoint and equivalence point titration for the food, water and chemical industries. 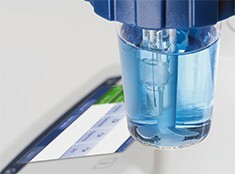 Titration Compact line featuring One Click Water Determination™ for volumetric and coulometric Karl Fischer Titration.